The flavours of north-east Italy are very distinctive. They love smoky tastes, sturdy ingredients such as polenta and the barley-like grain farro, and eastern exotica such as spices and pomegranates. I had this dish as soon as I arrived in the little Friulian village of Sauris after a terrible drive in thick snow, including an altercation with a snow plough. Elena, the chef-owner of the inn where I was staying, makes this with her own smoked goose, but I’ve substituted duck as it is easier to buy. This salad was followed by a goulash of beef cheeks, apple strudel and homemade blackberry grappa – not what you expect in Italy, and more than enough to make me forget about the journey. Sauté the onion and celery in the olive oil and butter until soft but not coloured. Add the farro, stir around in the buttery juices and just cover with water. Cook until the farro is tender and the liquid has been absorbed (25-35 minutes). To make the dressing put the mustard, salt, pepper and vinegar in a jug and whisk in all the other ingredients with a fork. Mix a third of it with the warm farro. In a bowl, combine the watercress, chicory and pomegranate seeds and add the rest of the dressing. 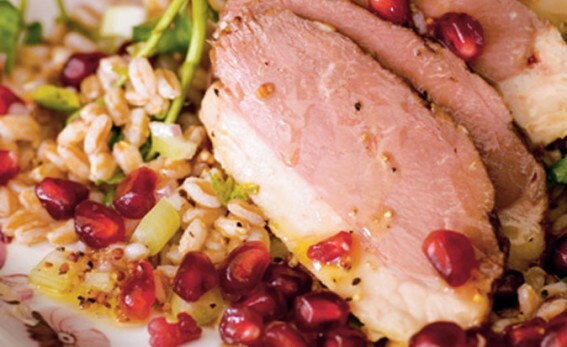 Divide the salad between 4 plates, top with the smoked duck, and put a large spoonful of the dressed farro alongside.